Product #46628 | SKU 14303 | 0.0 (no ratings yet) Thanks for your rating! 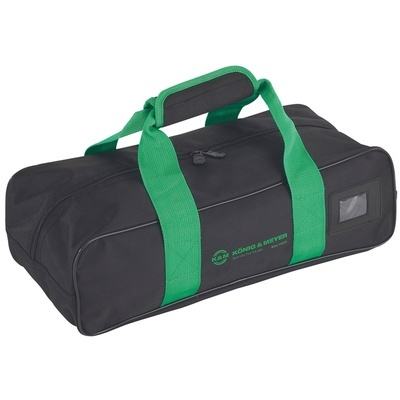 The Saxophone Stand Carrying Case by K&M is a well-made, water-proof nylon case with zipper and adjustable strap. It features two internal compartments for storage, a convenient luggage tag holder and a stylish silk-screened K&M logo. It is designed to accommodate two saxophones but also offers the flexibility to carry one saxophone along with a selection of K&M music or saxophone stands. Its attractive styling combined with its durable, road-worthy design will provide long-lasting and protective support and the wide handles with secured grip makes this case an easy tote.